Elephant Beach Club checks off all the right boxes for a hip beachfront venue: uninterrupted ocean views, lively hip-hop and RnB tunes, fun-filled events through the week and an extensive food and beverage menu. The party schedule is fairly busy here, with pool, hip-hop and deep house parties every Tuesday, Thursday and Saturday – and when visitors aren’t letting their hair down at a party, they’re likely to be enjoying one of the many fashion or music events held at this trendy venue. Elephant Beach Club is located at 159/75 moo 2, Bophut, p. +66 95 420 8051. Open 10am-2am daily. 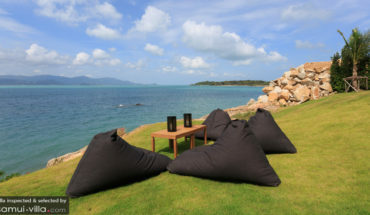 Nikki Beach Samui is located at 96/3 Moo 2 Lipa Noi, p. +66 77 914 500. The picturesque shores of Lamai Beach are just a few footsteps away for guests hanging out at Ocean Club at Beach Republic. Splashes of red, found in the furnishings and ornaments of this beachside lounge enliven its chic setting. The glistening infinity pool provides an undeniable attraction for sun seekers in the heat of the tropics. After taking a cool respite in its refreshing waters, climb out of the pool for a feast of delectable tapas, cocktails and mocktails. Beachside lounging does not get better than this! 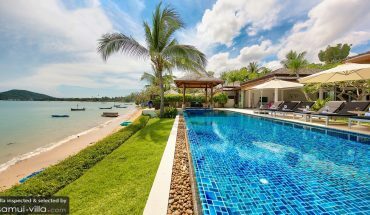 Ocean Club at Beach Republic is located at 176/34 Moo 4,Tambon Maret, Lamai Beach, p. +66 77 458 100. Stylish and vibrant, Cha Cha Moon is a venue that draws party-goers with a love for techno and underground tunes. The venue is split across multiple levels and sections, so there’s something for everyone – whether you’re in the mood for a wild night on the dance floor, or want a relaxed evening spent enjoying drinks and noshes with friends. And there’s a pool too – if you feel like cooling off with a dip. Cha Cha Moon Beach Club is located at 166/21, Chaweng Beach Road, Chaweng, p. ++66 77 300 222. Open Thursdays & Fridays, 9pm-3am. Enjoying a quiet location along the shores of Laem Set, The Beach Club will make you feel like you’re worlds away from the crowds. This enviable seafront venue offers plentiful perks, like a swim-up bar, access to a wide array of beach toys, freeform pool, numerous sun loungers and a thatched-roof beach bar, making the perfect hangout from day till night. 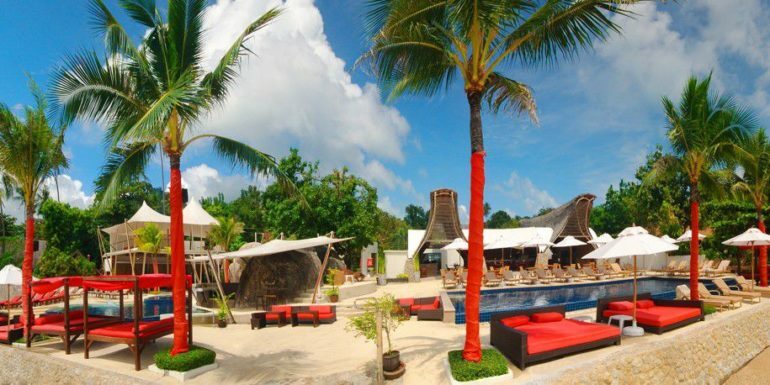 The Beach Club at Shiva Samui is located at 443/3, Moo 1, Laem Set, p. +66 77 418 256. 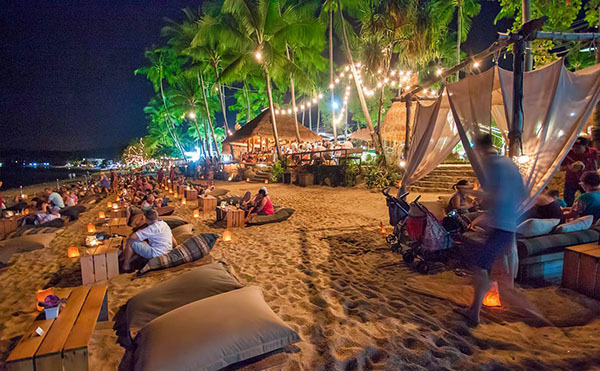 BEACH wins over diners with its unpretentious vibe, comfy bean bag loungers, friendly service, live music (featuring local acts) and mouthwatering fare. You won’t go wrong with ordering the spring rolls, chicken tacos and spicy meatballs, and the tapas-style servings faciliates sharing. Be sure to arrive in the early evening so you don’t miss out on a spectacular sunset show and excellent happy hour deals. BEACH Asian Fusion Tapas Bar is located at 73/7 Moo 4 Bangrak Beach, Bophut, p. +66 85 222 5772. Open Mondays-Saturdays, 5pm-12am. It’s not hard to see why Bamboo is a great hit with expats and travellers alike – this well-appointed venue features cosy bamboo huts (perfect for a romantic dinner! 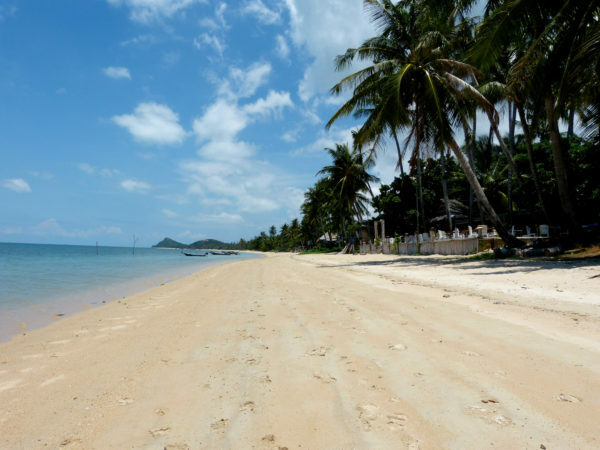 ), a prime beachfront location and tasty Thai fare. Recommended dishes include the massaman curry, green curry, satay and fried prawns. Bamboo Beach Bar Cafe & Restaurant is located at 53/5 Moo 4, Phang Ka, Elements Boutique Resort & Spa, Taling Ngam, p. +66 86 060 3118. Open 7am-2:30am daily. Just as its name suggests, No Stress exudes a laidback vibe that’ll set you at ease the moment you step into the venue. You’ll have everything you need for a relaxed day along the beach: sun loungers, patio umbrellas, fluffy towels, ice-cold beers, cocktails, coconuts and more. The menu throws out plenty of options for noshing too – from salads and mussel dishes, to heartier baguette sandwiches, grilled meat or seafood mains and good ol’ Thai classics like pineapple fried rice. No Stress Beach Bar & Restaurant is located at 127/64 Moo 3, Lamai Beach, p. +66 85 891 2102. Open 8:30am-9pm daily. Unpretentious and unfussy, this family-run restaurant is a great feet-in-the-sand venue for lazy, languorous days where an ultra-chic setting won’t do. Set along the white sand coasts of Mae Nam, Zenzibar draws beach-goers seeking a relaxed brunch, seaside dinner or a round of sundowners. The menu, featuring Thai classics, international fare, seafood dishes and a variety of cocktails offers something for every diner. Zenzibar is located at 18/33 Moo 1, Mae Nam, p. +66 86 268 8178. The family-friendly Secret Garden Beach Cafe welcomes a crowd of vacation makers and expats with its beachfront setting, relaxed vibes, well-decorated interiors and extensive menu. Apart from an ample selection of tasty Thai and European fare, guests with a hearty appetite can expect to feast on an array of beach barbecue and buffet feasts on the specials nights of the cafe. Secret Garden Restaurant & Beach Bar is located at 22/1 Moo 4, Ban Bangrak, Big Buddha Beach, Bophut, p. +66 77 447 703. Open 8am-12am daily. Settle down snugly into a cosy spot in the well-furnished [email protected]. 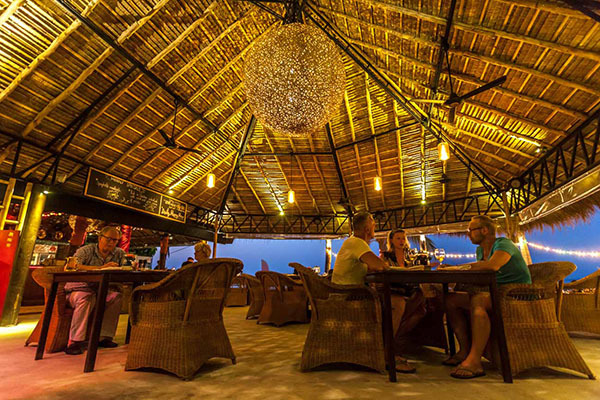 This seaside bar is a cool and classy spot for vacation makers to chill out and catch the mesmerising tropical sunsets. Arrive just in time for the happy hour, and you can take your pick from an extensive drink menu. It may be hard to stop at one, for [email protected]’s selection of intriguing sundowners are sure to hit a sweet spot. [email protected] is located at 14/3, Amari Palm Reef Koh Samui, Chaweng Beach, p. +66 77 300 306. Swing Bar is located at 109/12 Moo 3 Lamai Beach Road, Lamai Beach, Maret, p. +66 77 424 208. Open 8am-2am daily. 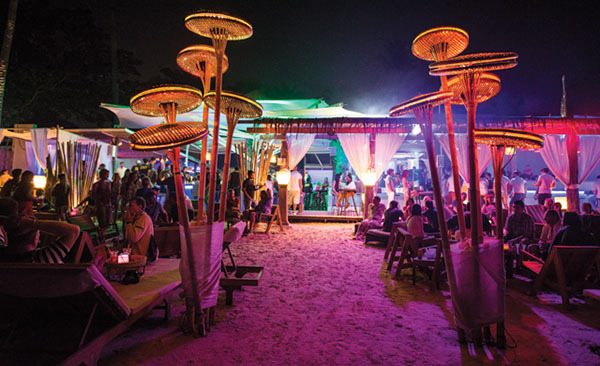 Holidaymakers on the search for a fancy beach bar along Bo Phut will find what they seek at Coco Tam’s. Guests are greeted by the sight of a well-landscaped garden decorated with tropical blooms and striking statues, before stepping out to a fine stretch of sandy coast splayed with low tables, gazebos and beach mats. The serene environment is perfect for an enjoyable night spiced up with a series of acoustic performances and fire shows. Coco Tam’s is located at 99/1 Moo 1 Bophut, p. +66 81 712 3333. Open 1pm-1am daily. Lovers of cocktails, Belgium beers and wines will find their slice of paradise at The Lava Lounge. With more than forty cocktails on the menu, be sure practice some level of restrain, or you may wind up downing more than just a couple of well-made concoctions. 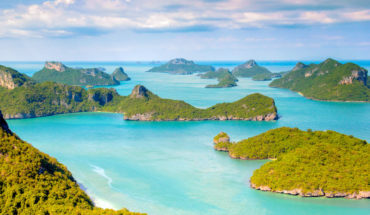 Soak up the cosy and relaxing vibes while you lay back against a comfy couch, with an icy drink in hand – this is the perfect hangout for travellers seeking a relaxing spot away from the banging beats and crowds of Samui’s bustling nightspots. The Lava Lounge is located at 109/21 Moo 3, T.Maret, Lamai Beach, p. +66 80 886 5035. Open 4pm-2am daily. Travellers exploring the streets of Bo Phut in search of a cosy and inviting pub will be delighted with The Crow’s Nest. Bedecked with wooden fixtures and amber lighting, the cosy vibes of this beachfront pub will set vacation makers in a jovial and cheery mood. Be sure to snag a table facing the ocean, for you will be rewarded with cooling gusts of sea breeze and breathtaking vistas of Samui’s northern coastlines. The Crow’s Nest is located at Fisherman’s village, Bophut, p. +66 81 797 1193. Open 4:30pm-2am daily.